Feel free to extract code snippets from AFT and use them in your own mod. While credit is always appreciated, you don't need to credit me if you only use a few scripts. Updated Affinity Trait management to better emphasis spouse AI evolution. Removed [X] Allow Autonomous Item Pickup as it didnt function as intended. Added Global Combat Setting "Scale Follower Damage" to address balance issues. Added Appearance Setting "Reset" for fixing follower animation issues. Added Action "Unlock Visible" See Readme for usage details. Updated No Collsiion Implementation. Used safer implementation. Fixed Sculpt bug that could cause ragdoll after sculpt. 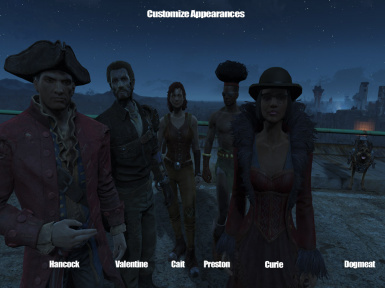 Fixed bug where initialization would fail outside the commonwealth. Fixed bug where initialization could fail if user was using PipPad. Fixed bug where interjections did not initialize until user loaded save game. Fixed bug where radio could stop working after interjection or rescuing spouse. Fixed bug where AFT Camp fire pit wasn't linked to storage until next Camp Setup. Fixed bug where followers often became immortal after trading with them. Fixed bug where dogmeat would not sneak with player. Updated code to avoid circular dependencies and possible init timing issues. Updated Gather Scrap with some missed items. Improve speed of "Select Follower"
Fixed Load Prefab. Added delay before showing Prefab to avoid timing bugs. Fixed bug that could cause Danse/Gage to use Sanctuary as default Home. 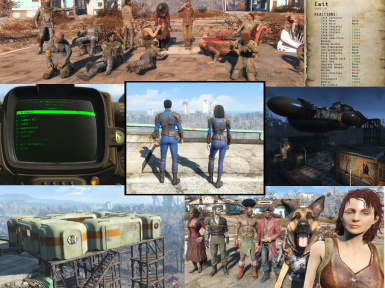 Fixed item loss bug when choosing "Unmanage Outfits"
Dogmeat no longer "ready weapon" by default. Added Spouse ability to now unlock Terminals as well as Doors. Castle Radio should no longer be broken when Loading full prefabs. 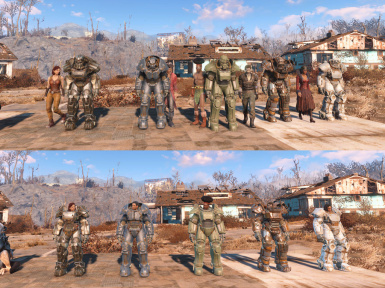 "Exit Power Armor" will now still appear/work if frame disappears. - Fixed Teleport bug that could break Quest "The Nuclear Option"
Fixed Inventory Bug where it would keep refreshing the weapon when changing equipment. Fixed Home assignment bug that could prevent assignable settlers. "Choose A Settlement" now always an option when assigning HOME. Fixed Bug where dismissing Nora/Nate (with dialogue) only worked once. Added [ ] UFO Building Toggle (If UFO doesn't appear when salvaged). Added [ ] Lock Doors to Camp Console Settings. Spouse : Fixed bug that may prevent non-affinity scenes from playing. Added Game Load checks to avoid/mitigate affinity stalling issues. Fixed Dismiss message to display correct Follower. Fixed new install issue with mod not being recognized. Timings updated so that Toggles are less likely to fail to update. "Manage Follower" became "Force Recruit NPC?" to clarify purpose. Fixed Camp Bar Stool persistence issue. Fixed bug that occured when using Master Control from inventory as a consumable instead of as a favorite. sculpting system used to create the player. scale followers size, change race, eyes or add gender agnostic hair. followers from all blurting out their comments at once. Disable or even flip follower likes and dislikes. using with a few button clicks when you enter a trading area. (Items assigned to outfits are considered used). and have AFT guide you to them with a quest objective locator. praying to add ambience to your camp or settlement. memory lounger that will take you back to the pre-war world. to enemies and weapon availability. preferred follower distance. Set aggression and Flee Combat settings. when teammates fall in combat. - Follower Mortality : Optionally make followers mortal. To make your current location their home. wish for more realistic responses to being shot. (reactions) and relationship info for those NPCs that support it. non-hostile NPC for pre-import evaluation. the end of Act 1 hint, hint), you can save them. See readme for more details on what to expect. transfer to another game locally. (Requires console access to load). work, but offers a way to get your settlement onto XBOX. Version 1.09+ includes DLC companion support. loadout while in Nuka world (once available). enabling the turrets will not cause raiders to turn agaist you. Version 1.17+ includes Prefabs for Far Harbor Settlements.